Las Vegas sightseeing tours offer an excellent overview and highlights of the Strip and downtown - the city is home to word's most fascinating hotels, museums, amazing shopping malls and other attractions! You can look at the city from the air and from the ground, by day and by night - and never get enough of it! Below I highlighted some of the best sightseeing tours within the city and around. When you are visiting Sin City you will be delighted to find out about the various sightseeing tours of The Strip. 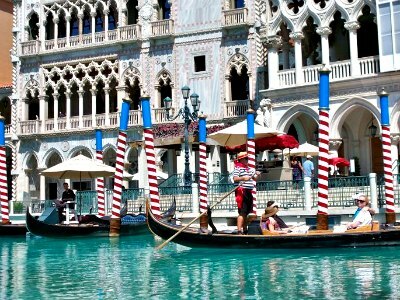 There is definitely an excursion for everyone’s budget and interests which may range from visiting the Bellagio Fountains to taking a selfie at the Welcome to Fabulous Las Vegas sign to walking into the Gold and Silver Pawn Shop. You can find a tour that includes a day with Elvis or you can visit numerous famous Reality TV locations and you can ride a Segway along Fremont Street. 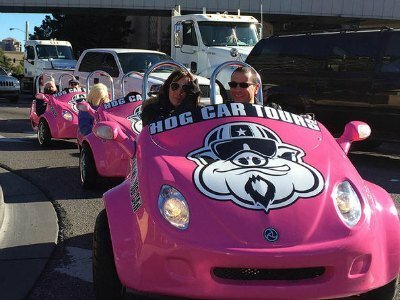 These excursions offer a wide variety of transportation options that range from walking to a pink Cadillac to a customized trike. No matter which tour you decide to try, we know that whatever happens in Las Vegas stays in Las Vegas but the memories will last a lifetime. Is there a better way to enjoy Las Vegas sightseeing tours than from far above the city? 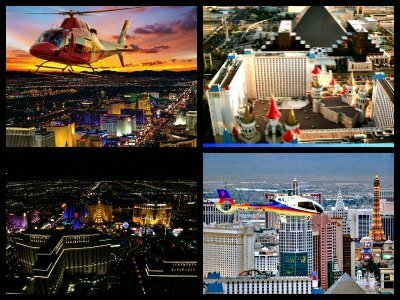 Helicopter flights are very popular here, especially at night when Vegas comes to life. The best part about helicopters is that they can fly slowly so you have lots of time to take in the sights. The helicopters in Vegas fly so close above the major attractions you feel like you can touch them - the dancing Bellagio fountains, the tower of the Stratosphere hotel, the Sky Beam of the Luxor, the erupting Volcano of the Mirage. This is an adventure you will never forget! 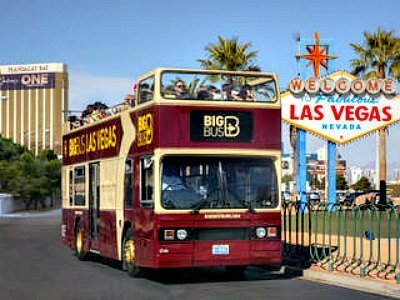 With Hop-on Hop-off bus you will have the opportunity to enjoy your Las Vegas sightseeing tour at your own pace. You can select between 24 hours and 48 hours options for just $5 extra. The bus has 2 routes and departs from 13 easily found locations. You can hop off the bust at any location you like and continue exploring it on your own. While you are on the bus, you will listen to the commentary of the tour guides. The hot air balloon Las Vegas sightseeing tour is a great way to see the city from the air! 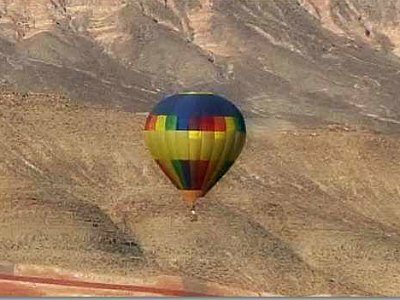 Balloons, steered by experiences pilots through the wind, slowly fly about 1000 feet above the city and the Nevada desert while you are taking in the sights! The flight starts early in the morning so you can watch sunrise. The flight itself is about one hour, but you will also have some time to learn how to inflate the balloon and tuck it away. It's something you will be telling your friends for ages! 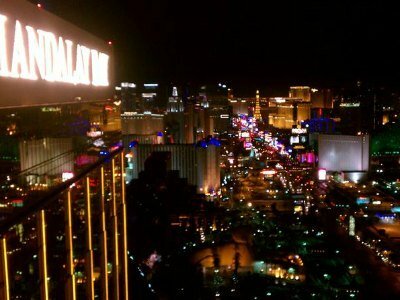 Here is a little special something for night owls and party animals alike - night-time Las Vegas sightseeing tours of the pubs and clubs! There are guided tours that can take you to the city's trendiest night clubs, bars and pool parties. Besides, you can get vouchers that will save you a lot of money on nightclub-hopping! 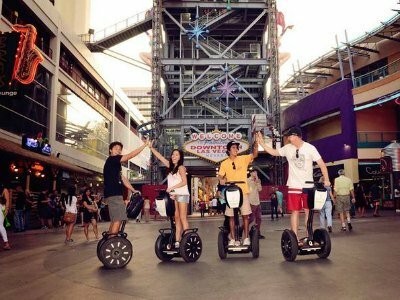 One of the best Las Vegas sightseeing tours you can take when you are feeling lazy is a Segway Tour. These fabulous excursions will take you to interesting places like the Arts District where you can view wall murals or Fremont Street where you can watch the overhead video screen that pops with colorful lights and don’t forget about the Strip where you will see all the glamour of Sin City like the Bellagio Fountains. You will be amazed on how easy to navigate your Segway is as you learn interesting things about Sin City. Another great place to ride a Segway is Red Rock Canyon where you will cruise on back roads while soaking in the incredible natural surroundings. No matter if you are young or old these types of excursions are perfect when you are tired but want to see everything you can in Las Vegas. Travelers can enjoy the night air and the splendor of the neon when you take the Las Vegas City Lights Night tour by Open Air Jeep. 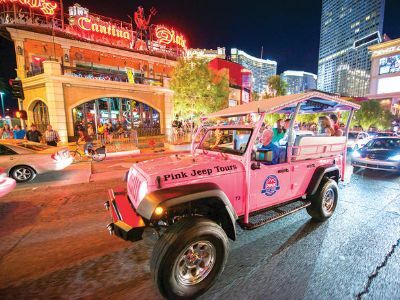 This 3.5-hour Las Vegas sightseeing tour starts when you are picked up at your hotel in a pink open air Jeep. Once on board you will drive to the Welcome to Fabulous Las Vegas sign for some great selfie opportunities. While cruising the Strip you will view places like the Gold and Silver Pawn Shop, the Fountains at Bellagio and maybe you can witness the volcano erupt in front of the Mirage. You will get a chance to spend some time in downtown and indulge in the Fremont Street Experience where your eyes will be dazzled by over 12.5-million LED lights. The night will be filled with adventure and fun as your expert guide tells you everything you need to know about Sin City. Your night to remember concludes with drop-off service back at your hotel. When you are ready to ride down the Strip in style then you should try the Ultra Limousine Tour of the Las Vegas Strip. 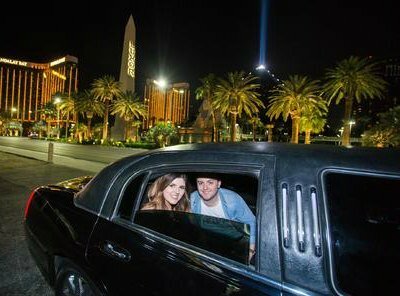 Your 3.5-hour Las Vegas sightseeing tour starts with hotel pick-up service where you will board a customized limousine that is designed for comfort, partying and sightseeing. Once you crack open a complimentary bottle of champagne the fun really gets going. Your first stop will be at the Welcome to Fabulous Las Vegas sign for some great selfies and then you head down the Strip. While you are cruising the Strip you will see the Bellagio Fountains, the volcano erupt at the Mirage, the pirates fight at Treasure Island and stop at the Fremont Street Experience. Here you will get the opportunity to witness one of the best light shows in the world on a four-block long video screen above your head. Your stylish adventure concludes with drop-off service at your hotel. The perfect Las Vegas sightseeing tour for everyone that loves Elvis is to try the Private Pink Cadillac Tour of Las Vegas with Elvis. Your 2-hour adventure with Elvis begins when he pulls up to your hotel in a vintage 1956 pink Cadillac. From here you will set out to the Welcome to Fabulous Las Vegas sign where you will have a champagne toast and take some photos with Elvis. Continuing on your journey you will drive past numerous wedding chapels including the Tunnel of Love Drive-Through Wedding Chapel and the Bellagio fountains. While you are on this excursion Elvis will entertain you with a couple of his signature songs as well as tell interesting stories about the history of his life in Sin City. There are added bonuses on this tour which include an 8”x10” souvenir photo of the King, a pair of stylish Elvis sunglasses and set of furry dice. Your experience with Elvis concludes with drop-off service at your hotel. A perfect Las Vegas sightseeing tour that is a favorite with foodies and pop culture junkies is the Las Vegas Strip and Downtown Scooter and Foodie Tour. Your 4-hour adventure begins with complimentary hotel pick-up service where you will be taken to board your scooter which is a modified trike with a pink race car chassis. The first stop on your excursion is to fill your stomach with some of the best food that Sin City has to offer. From here you will drive to the Welcome to Fabulous Las Vegas sign for a quick photo opportunity before stopping at the Bellagio where you will stroll through Conservatory Garden. You will view the Chihuly “Fiori di Como” glass sculptures as well as the tallest chocolate fountains in the world and then you will drive to Gold and Silver Pawn Shop. Driving through downtown and the Fremont area you will view art murals in the Arts Districts and pass Counts Kustoms before going to Vegas Rat Rods where you will see some fantastic customized cars. Your excursion concludes with drop-off service back at your hotel. One of the more popular excursions for people who have dreamed about spending a day with Elvis in Sin City is the Pink Cadillac Tour of Las Vegas. 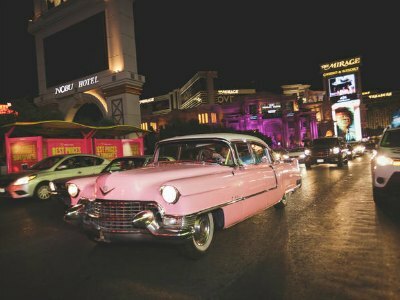 Your exciting Las Vegas sightseeing tour begins with select hotel pick-up service when Elvis arrives in a vintage 1955 pink Cadillac. 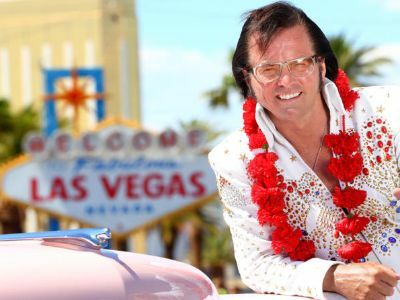 Once on the road Elvis will give you a great historical look of Las Vegas as well as tell you interesting stories about his time spent in Sin City. You will travel to such superb places like the Welcome to Fabulous Las Vegas sign, the Fountains at the Bellagio and the fantastic light show at the Fremont Street Experience. The entertainment is non-stop with Elvis belting out a few of his signature songs along the way and when you stop for photos you can be assured of a few twists of the hips. Your great day with Elvis ends with free drop-off service at your selected hotel. When you want to see all the neon lights that light up Sin City in a comfortable setting then the Las Vegas Night Tour of the Strip by Luxury Coach is the perfect Las Vegas sightseeing tour for you. This 3.5-hour excursion begins with free hotel pick-up service when you meet your expert local guide and board a customized touring coach that seats 25 people. You will ride in style with plenty of leg rooms and extra-large viewing windows as you stop at fantastic places for photographs like the Welcome to Fabulous Las Vegas sign and view the erupting volcano at the Mirage. You will travel past the Fountains at Bellagio to the Fremont Street Experience where you will learn about the history of Glitter Gulch while you watch the incredible light show. Your excellent adventure concludes with complimentary drop-off service back at your hotel. When you are ready for someone to take hundreds of selfies of you while you tour the Strip in style then the Exclusive Las Vegas Strip by Limo with Personal Photographer is an ideal excursion. This Las Vegas sightseeing tour has a 1 or 2-hour option which will have you seeing all the important sights in Las Vegas and your personal photographer will take all the photos for you. 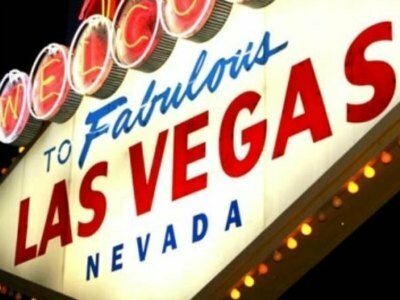 You will stop at the historic Welcome to Fabulous Las Vegas sign, view the fountains at Bellagio; stop at the Paris Casino and the MGM Grand as well as the Excalibur. Don’t be surprised when Elvis appears in photo bomb fashion in one of your personalized photos and you can customize the stops to enhance the value of each photograph. An added bonus on this excursion is complimentary pick-up/drop-off service to your hotel and a free bottle of champagne. 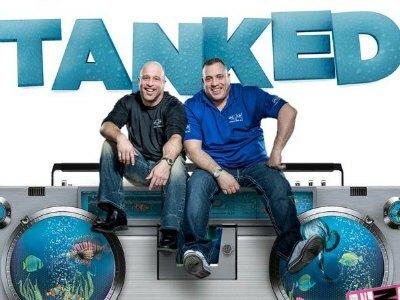 An ideal excursion for families and reality television show fans is the Behind the Scenes Tour of Tanked the TV Show. This 90-minute Las Vegas sightseeing tour begins at Acrylic Tank Manufacturing (ATM) which is showcased on Animal Planet’s hit show Tanked. Once inside the 37,000 square foot manufacturing plant you will get the opportunity to view the intricate aquariums that are produced at the plant. These works of art are a true gem to see and your expert guide will inform you of all the history of ATM as well as personal backgrounds of the stars of the show. During the tour you might even get a chance to meet one of the stars of the show like Brett, Agnes, Wayde or Robert the Redneck. A perfect family friendly Las Vegas sightseeing tour that is sure to please everyone is the Las Vegas Reality Show VIP Tour. On this 4.5-hour excursion you will leave from selected hotels where you will be taken to your first stop the Gold and Silver Pawn Shop. 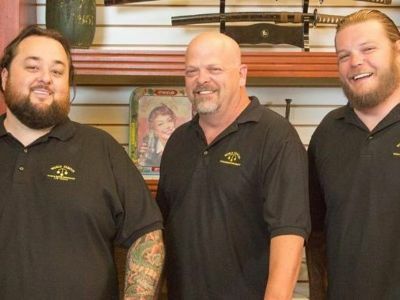 Here you will get a chance to see all the guys from Chumlee to Rick to Corey as well as view interesting one-of-a-kind merchandise for sale. Traveling onward to Acrylic Tank Manufacturing where you can view the incredible aquariums that are manufactured on the Animal Planet’s hit show Tanked. Next up you will see all the fascinating cars at Counting Cars which include a 1981 Corvette before heading to American Restoration where you will watch rusty old items find new life and a new home. Your last two stops include the Toy Shack which specializes in unique collectable toys and sports fan will be delighted when they peak into the Ultimate Sports Cards and Memorabilia shop. Your excursion concludes with drop-off service to selected hotels. 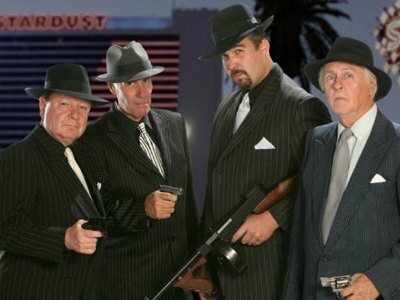 If you are interested in learning more about organized crime in Sin City then a great Las Vegas sightseeing tour is the Vegas Mob Tour. Your 3-hour journey into the past will start when you meet your local mob expert at Tuscany Suites and Casino. From here you will take-off to the streets and view many of the places that secret hits by the Mob took place. During your excursion your knowledgeable guide will tell you all about the intricate connections between Sin City and the gangsters who controlled the area. Concentrating on the glory years of the Mob between the 1940s and 1980s you will be fascinated with the eerie history. The highlight of the tour is visiting many of the spots that were used to film the movie Casino starring Robert De Niro and Joe Pesci. There are added bonuses on this excursion such as complimentary pizza and an entry ticket to the Mob Museum which you can visit at your own leisure. 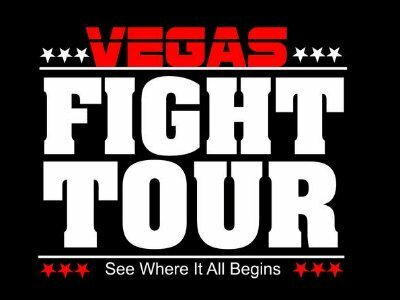 Las Vegas is home to some of the best training facilities for fighters and the Vegas Fight Tour allows you to view the places where champions learn their trade. This 3-hour Las Vegas sightseeing tour will begin in a central location along the Strip where you meet your local guide who will explain all the interesting places you are about to visit. During your tour you will visit four workout facilities that specialize in training MMA fighters and/or professional boxers. Your first stop will be the must see Xtreme Couture Gym which is owned by UFC heavyweight champion, Randy Couture. You will then travel to the Wand Fight Team Gym, owned by Wanderlei Silva which has been named the Best MMA Gym by the magazine Fighter’s Only. Stop number three is the Mayweather Boxing Club which was highlighted on HBO’s All-Access series and is the home training facility for the undisputed champion of the world Floyd Mayweather. Your exciting Las Vegas sightseeing tour will conclude at Johnny Tocco’s which is packed with history. Constructed in 1953 this gym has seen the likes of Marvin Hagler, Muhammad Ali and Mike Tyson prepare for fights. The 2-Hour Las Vegas Strip Walking Tour with Photographer is an ideal Las Vegas sightseeing tour that has you viewing incredible lights and action of the Strip at night. Your 2-hour excursion starts when you meet your local guide/photographer at the Conservatory Gardens at the Bellagio Hotel and Casino. After touring the gardens you will stop for the fountain show before heading to the Cosmopolitan’s Chandelier Bar. You will then walk to Crystals and then view the giant waterfall at Aria in the Mandarin Garden before strolling to the Park at the Monte Carlo. You will take a few photos in New York New York and then walk to Excalibur and the Luxor. 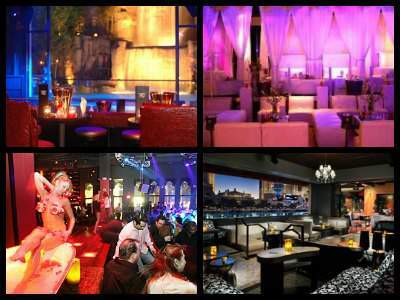 An added bonus at the end of your Las Vegas sightseeing tour is VIP entry to LAX, the Light Nightclub or the Foundation Room.